The first residents of Forest Park moved into the community during the summer of 1956. A meeting was held on April 10, 1957 hosted by Mr. Warner developer of Forest Park to help the Forest Park women organize a club. The need for a club was strongly felt since the women were few in numbers and in the “middle of nowhere,” it would be a way of getting together socially. An election of officers was held; the constitution and by-laws were adopted. 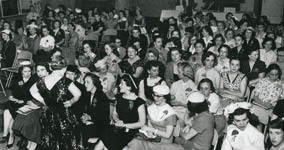 A dinner was held on June 19, 1957, hosted by the Greenhills Women’s Club and the first officers of the Forest Park Women’s Club were installed. From the very beginning our club assisted the Union Central Life Insurance Company to rezone land so they could relocate to Forest Park. The club was successful in getting a branch of the Public Library located here as well as starting and supporting libraries at Kemper Heights and Cameron Park schools. Women’s Club took over printing the Forest Park Newsletter, later changed to the Village Voice Newspaper. Five thousand dollars was donated to the Fire Department for their first ambulance and in the following years purchased two resuscitators, another fund for the purchase of a second ambulance, and the purchase of a thermo-heat detector camera. Rosie the Robot was bought for our police department for use as a school training aid along with Teddy Bears and little hand made quilts for traumatized children. Forest Park Women’s Club donated $2,500 toward the Bicentennial Plaza located at Winton & Kemper Roads and also presented the city with a bicentennial fountain. Park benches were purchased yearly by our club and placed throughout Forest Park. Over 8000 mailings were sent by members proving successful in bringing the first Hospice to Cincinnati. The ladies also worked collecting gifts for the first WCET Action Auction. Over the years, the club has participated in many types of fundraising such as dances, surveys, selling cookbooks and community directories, folding boxes, rummage sales, raffles, candy sales, kitchen buddies, selling tickets for two different area Homemaramas, and other projects. The big money maker however is the Craft Show held for 24 years presently located at the Winton Woods High School the last Saturday of every October. Although the club has donated extensively over the years, our main goal is the scholarship fund. The first scholarship was awarded in 1967 and increased to two in 1971 and in following years 4 scholarships of $500 each have been presented to senior students attending Winton Woods, Roger Bacon, Xavier, Greenhills High Schools and others while residing in our community. The disbursement committee sent donations, at the written requests/suggestions by the members, to the Salvation Army, Red Cross, S.O.U.L. Pantry, Leukemia Foundation, Hoxworth Blood Center, and Mathew 2 Ministries to name a few. The ladies have also sponsored a local boy scout and girl scout troop for many years, Winton House, Longview Hospital, The Elite Nursing Home, later Ridge Nursing Home and presently the Meadows in Forest Park have been given many bingo and holiday parties including gifts and clothing. Our club was federated from 1962 to 1970. Our members have accumulated thousands of volunteer hours yearly and continue to sew for Children’s Hospital, Drake Hospital and the Alois Alzheimer Center. Little caps are knit for newborn babies at Good Samaritan Hospital, treatment turbans made for cancer patients and disposable pillows for Hospice. Winter clothing is donated for Winton Woods school children and meals on wheels delivered, tutoring in our schools and books are given for soldiers and various clinics, just to name a few. Forest Park Women’s Club was founded in 1957 and was named the oldest continuous organization in our community and inducted into the Forest Park Civic Hall of Fame in 2001.
at the Forest Park Senior & Activity Center, 11555 Winton Rd.